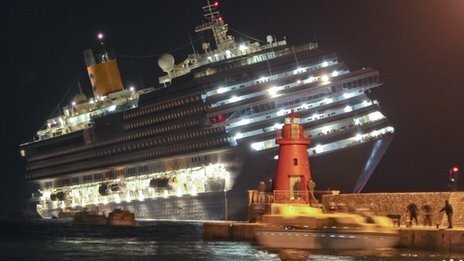 We all Know, Costa Concordia was partially sinking in Italy from 13 January 2012. Initially, they defueled the 2,380 tonnes of heavy oil from the ship. They used a process called Hot- tapping, pumping the fuel out into a nearby ship and replacing it with water. so it doen’t affect the ship balance. 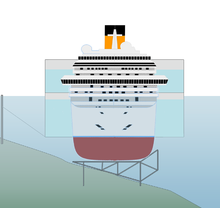 A work started to build an underwater metal platform and artificial seabed made of sand and cement on the downhill side of the wreck and welding projection from the side of the water craft, above the surface of the ship. Once the projection was completed , it was pulled by cables to settle on the platform. This method is know as parbuckling. The two firms has done this successfully are Titan salvage with it’s partner Micoperi. 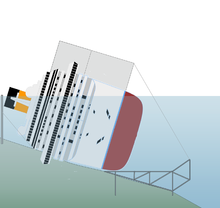 The same method is used in 1943 USS Oklahoma ship was rotated 180 degree to upright after being sunk in the attack on pearl harbor. Using the cables they pulled upright.